I like the CC games with operational layers (like The Longest Day and Last Stand Arnhem). Without that, I do prefer “finicky” Combat Mission (and more even the newer ones) to Close Combat, the tactical game where charging on HMGs in the open is a thing, every sniper are as good as Lady Death and buildings only have one floor. I think they were pretty awful. They took a 15 year engine and did nothing with it, and the released ‘games’ had a bunch of oversized maps that the game engine, UI, game design, battle AI and vehicle AI could not cope with. They were completely unfun to play. They blights upon the Close Combat name! I also still bought most of them because I’m a sucker. I also never played Panthers In The Fog. I keep meaning to try it, but I imagine my Tiger will zig zag down a road and I’ll get angry and quit. I think they were pretty awful. Full HD displays nearly killed them. They have a surprisingly loyal fanbase, which have stuck around since like forever. In a similar way as communities formed around Steel Panthers have endured like a full decade without a decent patch. I keep meaning to try it, but I imagine my Tiger will zig zag down a road and I’ll get angry and quit. The CC news for the last 5 or so years has been “one guy working on it. Will be done in a few years”. This was briefly interrupted by the announcement “game changed engines, one guy starting from scratch, will be a few more years”. To be fair, it’s been a problem since the first game. “No! I said REVERSE, not randomly rotate and occasionally go backwards, only to rotate too far and get shot in there rear!! Argh”. But what was excusable in 1998 is inexcusable in 2018. In CC2 it was ok because the maps were small and your tanks were relatively static, providing support most of the time. But all of the new games feature huge, open maps that the tank AI simply cannot cope with. It’s makes the game tedious and frustrating. Plus they never changed the setup mechanic so you have to stick a companies worth of men inside the same bush. 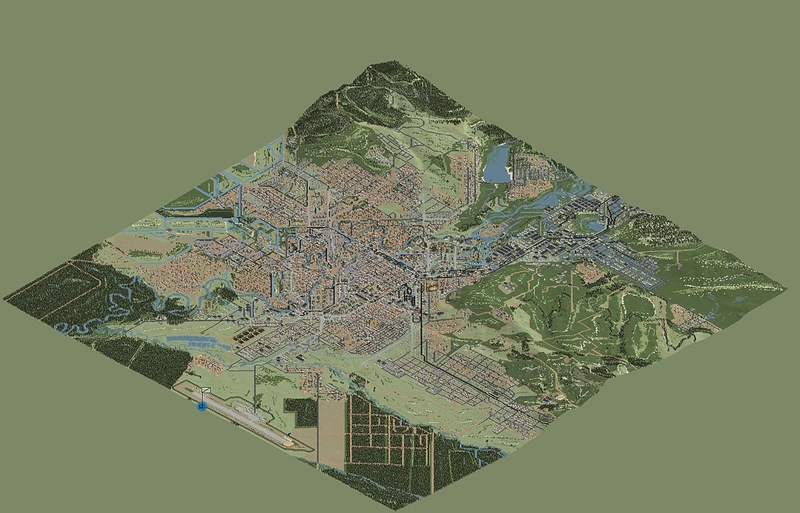 Still, I love me some overhead aerial photography based maps. Everytime I look at the English countryside from a slightly elevated position I immediately think of Close Combat 2: ABTF, and about where I’d be positioning squads. Still, I love me some overhead aerial photography based maps. Every time I look at the English countryside from a slightly elevated position I immediately think of Close Combat 2: ABTF, and about where I’d be positioning squads. I have such great memories of that game. Thirty years ago! Wait, just twenty. Ok.
Got back into Enemy Action Ardennes for some solo stuff. Every time i get back into it i get better at administering the German movement and when the Germans crossed the meuse on the second day, i learned the importance of roadblocks. People have commented to me that the bots were so-so and I’m all like well you must be a military genius. His Majesty’s Government sends Viceroy Kane a paltry 10 pounds this year. He is expected to do more with less, and secure Pennsylvania once and for all. The French declare war on Britain. They send the French Army (a mighty 6-7-8!) to Boston, and the French Fleet to the Caribbean. Meanwhile, His Majesty’s Government releases a 3-3-4 British Foot and a 3-1-2 loyalist foot to the force pool. Smugglers deploy to Long Island Sound and Chesapeake Bay. As a result, two Continentals will be placed in New England, two in New York, one in Pennsylvania, and one in Carolina, unless my Navy interdicts them. Admiral Howe and his ship of line deploy to Delaware Bay, Arbuthnot and his frigate squadron deploy to Cape Fear, and Graves goes pirate hunting in Long Island Sound. (Costs 4 pounds, down to 6). Delaware Bay and Cape Fear are cleared of units, but Massachusetts Bay and Long Island Sound reman lousy with smugglers. 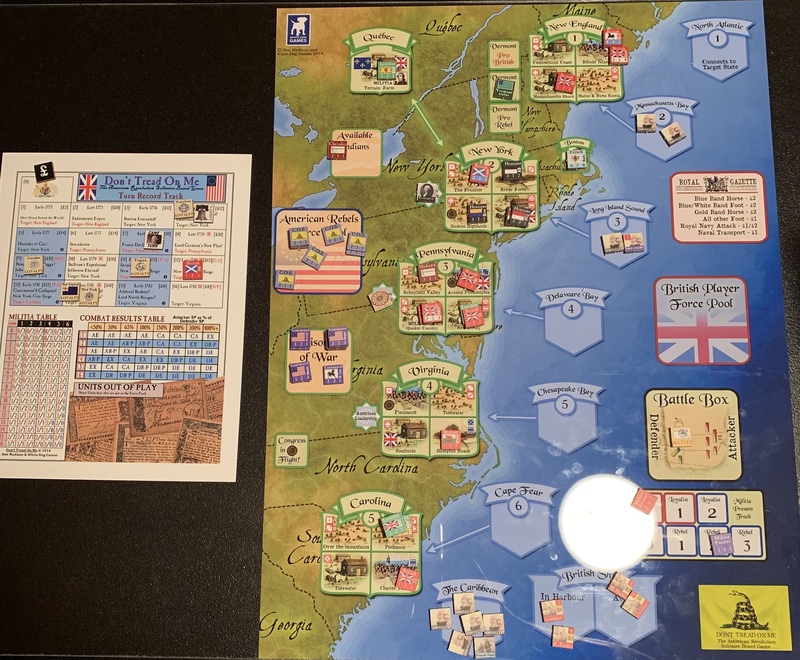 I will decline to use my navy to shadow the French, which means that if there is a fight on a blue die county, the French may intervene on a roll of 5 or 6. This is a winter attrition turn, so I roll for the Continentals in Carolina, who are eliminated on a 1 or a 2. Unfortunately for the British, the Continentals in Carolina are easily able to forage and keep warm, and survive a harsh Winter as an intact fighting force. The British Amnesty two units of Continental Army troops (a 2-2-2 and a 1-3-2). There are no captured British, Loyalist, or Hessian units, so there is no Prisoner exchange this turn. Viceroy Kane spends three pounds (down to three remaining) to purchase the 3-1-2 and 3-3-4 foot units. The 3-1-2 deploys to Caroline, in the Over the Mountains region. The 3-3-4 deploys to Pennsylvania, in Quaker Country. Kane moves 9 SPs of British infantry into Quaker Country, to fight the COS there at 9-1. No militia intervene, so the Brits roll on the 300%+ table, thanks to the column shift provided by Congress. The rebels are eliminated, and loyalty stays put due to the presence of Washington. Kane moves 12 SPs of British units, including the British Horse unit, from Over the Mountains to the Piedmont in Carolina, where they face 6SPs of Rebels. A strong militia presence for the Rebels forces the Brits to roll on the 150% table. Luckily, the British Horse are able to disrupt the Rebels and the Foot are able to close and eliminate them in detail. Carolina loyalty +1, to 7. A COS deploys to the Frontier in New York, ready to face off against the hated Hessians deployed there. Light Horse Harry Lee deploys to the Connecticut Coast (2-3-1), and a 2-2-2 Continental deploys to Maine/Nova Scotia. Benedict Arnold deploys to the River Forts in New York (3-2-1), and a 2-2-2 deploys to the Frontier. The Battle of the Frontier in New York begins at 4-3, favoring the rebels. The balance of the militia favors the Hessians, surprisingly, and so the Rebels attack on the 1 to 1 column. The Rebels retreat to the River Forts, and the Hessians pursue. Because Washington has taken command, no loyalty changes. The Battle of the River Forts pits 4 rebel SPs against 5 British SPs. Militia makes that 5 Rebel to 7 Brit. Rebels roll on the 65% table, resulting in an exchange. Only the Hessians are left standing in New York. The Rebels launch minor campaigns in New England and Carolina. A 2-2-2 Continental joins Lee in the Connecticut Coast, and a COS appears in Over the Mountains in Carolina. The Rebels in New England combine to assault Rhode Island. The French do not intervene, as they receive notice too late (the fleet being in the Caribbean at this time. The British Horse moves to support the Lobsters in Rhode Island, resulting in a 5 Rebel to 7 British battle, prior to Militia. Militia make it 6 to 9, which is just enough for the Rebels to roll on the 65% table. An overaggressive Lee charges into the guns in Rhode Island, and the Rebels are eliminated. +1 loyalty, to 13. The COS in Carolina attacks the large gathering of British troops in Piedmont, starting at 2 SPs to 12 British SPs. Despite strong Militia support, the Rebels still attack on the less than 50% table. The ill-fated attack is quickly mopped up by British and Loyalist troops. +1 loyalty, to 8. The British Spend 2 pounds to buy some loyalty in Pennsylvania. Naval Transport. The British spend 1 pound to transport the 3-3-3 British Foot in Quebec to New York. Now that the French have intervened, the Rebels are focused on the colonies, rather than futile expeditions to Quebec, so it no longer requires a substantial defense. British have control of all five states this turn. That means that Liberty stays at 4. Loyalty increases by 1 in New England, Virginia, and Carolina (to 14, 11, and 9 respectively). Loyalty in New York remains static (at 14), because Hessians still anger the local population. Loyalty in Pennsylvania goes down by 1 (to 3), thanks to the presence of Congress giving hope to the Rebels, and the presence of the Mohawk tribe angering the populace. I roll three dice now that the French have intervened. Ships Diverted! : Admiral Parker and Vice Admiral Arbuthnot are sent to monitor French activities in the mid-Atlantic, and will be unavailable to hunt smugglers next turn. Convention Army: The Rebels who captured British Foot at the Battle of the River Forts refuse to exchange prisoners, instead condemning them to prison camps in Virginia. I will not be able to reconstitute that unit for 5 turns (until Late 1780). Quite unsporting of them! This was a good turn for the Brits, but next turn may be tougher, given that all of my units are deployed on the map, and I have lost two of my naval units for the turn. Virginia is vulnerable if the Rebels are able to place a smuggler in Chesapeake Bay, and Pennsylvania is still at some risk, given its low loyalty and the presence of the Continental Congress and accompanying column shift. In Parliament, support for Viceroy Kane is to remain stable at 10 pounds, but Lord Germain, the colonial secretary, is laying the groundwork for a new plan for victory, allowing recruitment of new Loyalist and British units. You totally nailed that @Pod. Sometimes it is better, both in software and life, to start from scratch - reusing stuff perhaps - than to get lost in an endless stream of small incremental hacks that eventually nobody will notice or care about. 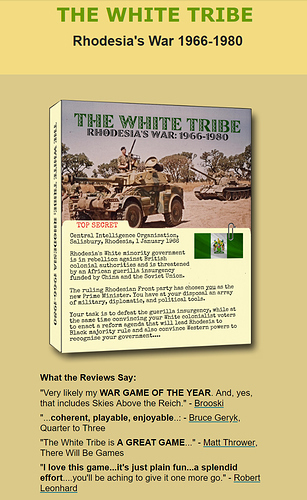 So I just listened to the 3MA podcast on Armored Brigade, and it sounds just fascinating. Are any of y’all playing/still playing it? I am! I still pop it in for a skirmish game. 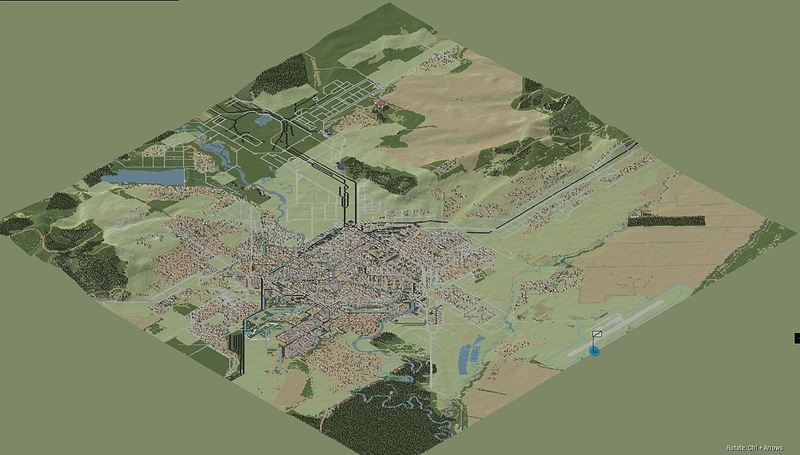 I want to download some new maps , the Chechnya one looks good. Just FYI though Brian I would strongly recommend watching a play through for at least a few mins before purchase just to make sure you like the look of the GUI in particular. But yeah still playing it and I love it! His Majesty’s Government sends ten pounds to Viceroy Kane to provide for the defense of the American Colonies. More importantly, Lord Germain, the Colonial Secretary, lays out a new plan for securing the colonies. He provides support for the training of Loyalist Foot (2-2-2) and Horse (4-3-2), as well as an additional British Foot (3-3-3) and Hessian unit (2-1-3). Two Smugglers deploy to Cape Fear in Carolina. Hurricane Warning Flag: The French Fleet Rebases to Boston, making French intervention easier. I will send Vice Admiral Graves to Shadow the French, and Admiral Howe and his Ship of the Line to Cape Fear to interdict Rebel Smugglers. Viceroy Kane does not need to pay to shadow the French, as that comes out of the Admiralty’s budget line. Admiral Howe fails to interdict smugglers in Carolina. The British Amnesty five 2-2-2s and Benedict Arnolds 3-2-1 unit. No prisoner exchange this turn, as the only British prisoners are languishing in Rebel prison camps in Virginia, in violation of all norms of common decency. Viceroy Kane spends six pounds to purchase units (down to two pounds remaining). There are no current Rebel units on the map. Viceroy Kane deploys the Hessians to New York in the River Forts, the British and Loyalist Foot to Massachusetts, and the Loyalist Horse to Carolina. The Loyalist unit in Quebec (1-3-2) also takes a long forced march to Carolina, where it will contribute in the Tidewater region. 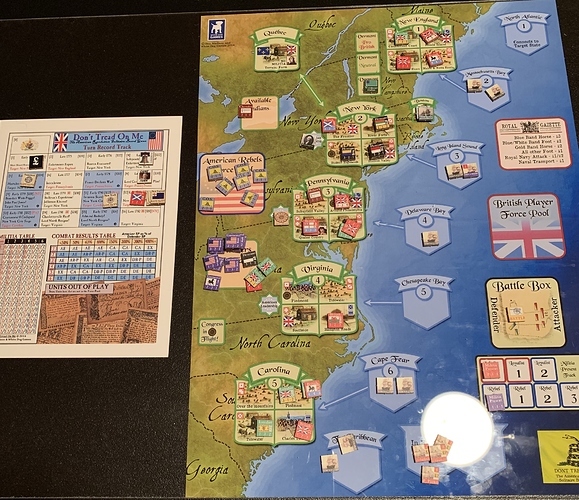 A Rebel COS deploys to Pennsylvania, setting up a 7-1 conflict favoring the Brits. Two units of 2-2-2 Continentals deploy in Tidewater in Carolina. A unit of 1-3-2 Continentals deploy in Rhode Island, and a 2-2-2 Continental deploys in the Massachusetts Coast. A 3-1-2 Continental deploys in the New York Frontier, and a 2-2-2 Deploys in Hudson Valley. The Battle of Rhode Island: 2 Rebel to 7 Brit before Militia, as the French do not intervene. 3 to 9 after Militia intervene. Rebels roll on the less than 50% table and are eliminated. Loyalty +1 (to 15). The Battle of Massachusetts Shore: British Horse intervene, bringing the totals to 2 to 7 in favor of the Brits. Militia make that 4 to 9, so Rebels roll on the less than 50% table again. This time, the Rebels force an Exchange, eliminating the British Foot. The Brits still win though, and loyalty goes to 16. The Battle of the Frontier: 3 Rebel to 6 Brits before Militia. 2 Loyalist militia turn out, making it 3 Rebel to 8 Brits. Rebels roll on the less than 50% table again, and again cause an exchange. The rebels are eliminated, but they take one of the hated Hessians with them. No loyalty change due to Washington. The Battle of Hudson Valley: 2 Rebel to 6 Brits. Militia comes out in support of the Brits, so the Rebels again roll on the 50% table, and are again eliminated. The Battle of Philadelphia. This is a 1 to 7 battle in favor of the Brits before the militia, as once again the French fail to intervene. Two rebel militia come out, making it 3 to 7. Because of the Presence of Congress, the rebels roll with a column shift on the 50% table. The Rebels score an exchange, but the 3-3-4 British Guards remain. Plus one loyalty, to 5. Congress has been put to flight which gives another +1 loyalty (to 6). The Battle of the Tidewater: British Cavalry come to join the fray, bringing the pre-militia totals to 4 Rebel to 10 Brit. Militia come out in favor of the Brits, making it 5 to 12, and Rebels roll on the less than 50% table. British Horse are too powerful for the Continental army, and they are eliminated. The Rebels launch a major campaign in Carolina, deploying a COS and 2-2-2 Continental Unit. The Rebels attack Piedmont, which is reinforced with British Horse. The Battle of the Piedmont starts out as a 4 to 16 Battle in favor of the Brits. Militia make that a 6 to 17 Battle, but the Rebels are still forced to roll on the less than 50% table. The Rebels force an exchange, eliminating two loyalist foot units. Loyalty increases by 1, to 11. Viceroy Kane spends one pound in Pennsylvania, saving one for next turn. Pennsylvania loyalty moves to 7. Congress reconvenes in Pennsylvania, decreasing loyalty to 6. The British Control all five states, so Liberty remains at 4. Loyalty increases by one in New England, Virginia, and Carolina to 16, 12, and 12 respectively. New York goes down 1 to 13, due to Washington’s presence, and Pennsylvania decreases by 1, to 5, due to the presence of the Mohawk Tribe and Congress. Hessian Atrocities! : Hessians massacre civilians in the Hudson Highlands while looking for a phantom Rebel COS. New York’s loyalty reduces by 2, to 11. War in India: The 3-3-3 British infantry, currently in a Rebel prison camp, is rescued and sent to India to fight in a colonial war on the other side of the world. Loyalty Oath: British demands for a loyalty oath in Massachusetts backfire, resulting in a loss of 5 loyalty (to 11). Anti-French Hysteria: Many Colonials in Boston resent the Catholic French, and provide information to British Forces. Loyalty +1, to 12. Dutch Smugglers: The blasted Dutch send a smuggler to Delaware Bay, hoping to sell arms to Rebels in Pennsylvania. Vermont: Angered by the Hessian atrocity, Ethan Allen’s Green Mountain Boys come in to New York from Vermont to aid the Rebels. The Rebels now have a column shift in their favor in New York. Update: Because I can’t read, I missed the fact that there are loyalty ceilings for the various states. That pushes New England down to 9 and Virginia down to 11. The other states remain unchanged, but I definitely got some help from having higher loyalty in New England than I would otherwise be allowed to. Virginia has been relatively quiet, so it has less of an effect. His Majesty’s Government allocates ten pounds to the colonies, bringing my total funds to eleven pounds. Rebel General Benedict Arnold weds Tory sympathizer Peggy Shippen. Kane may now attempt to turn Arnold to the British side. John Paul Jones! : John Paul Jones defeats British ships in our home waters. The final privateer deploys to the Caribbean. No smugglers are placed this turn, as I rolled spaces that were already fully occupied. The French Fleet rebases to the Caribbean now that hurricane season is over. Viceroy Kane sends Vice Admiral Arbuthnot to shadow the French Fleet. Admirals Howe and Parker are sent to Long Island Sound, and Vice Admiral Graves is sent to Delaware Bay. Reserves go down to 6 pounds. A privateer is eliminated from Long Island Sound, but a smuggler remains. The smuggler in Delaware Bay is also eliminated. No Continental units are on the board, so there is no winter attrition this year. Amnesty and prisoner exchanges result in all Continental army units except Light Horse Harry Lee returning to the force pool. A 3-1-2 Hessian, 3-2-1 Loyalist, 2-3-1 Loyalist, and 1-2-3 Red Coat are returned to the British force pool. The Hessian will deploy to the Hudson Highlands in New York. The 1-2-3 British unit deploys to Charles Town Carolina. The 2-3-1 Loyalist deploys to Connecticut Coast, and the 3-2-1 Loyalist deploys to Maine & Nova Scotia, both in New England. A rebel COS deploys on the Massachusetts Shore, which is currently 2-1 in favor of the Brits. Benedict Arnold deploys to the New York Frontier. 3-3. 2-2-2 Continentals deploy to Piedmont and Charles Town in Carolina. 5 SPs worth of Continentals deploy to Rhode Island (5-4 Rebels). Battle of Rhode Island: The Rebels have a 7-5 advantage after militia, and the French do not intervene. The rebels roll on the 100% table, Rebels retreat to Massachusetts Shore. Battle of Massachusetts Shore: British Cavalry ride to the aid of the Redcoats at the Massachusetts shore. After militia, the battle is 6-8, so the Rebels roll on the 65% table. The Rebels are forced to retreat, and because they have no where to go, they are surrounded and eliminated by the British. Battle of the Frontier: Benedict Arnold betrays the Rebel Cause! The Arnold Continental Congress unit returns to the box, and a 2-1-3 Loyalist unit enters the British force pool. Battle of the Piedmont: 3-13 after Militia, so the rebels fight on the less than 50% table. The Rebels retreat to over the Mountains. Battle of Charles Town: Cavalry ride to support the Lobsters in Charles town, making it a 3-13 fight after militia. But the French intervene! The French fleet deploys to Cape Fear, and the French Army comes to Charles town, making it a 11-13 fight. Rebels now roll on the 65% table. The rebels retreat to Over the Mountains and the British pursue. The British attack on the 100% table. In a bloody exchange, all of the units are eliminated. The Rebels begin minor campaigns in New York and Pennsylvania. A 3-2-1 Continental is placed in the New York Frontier, and a COS is placed in Quaker Country. Battle of the Frontier: Rebels battle at 2-5, and so roll on the 50% table, thanks to the Green Mountain Boys column shift. The Continental Unit is eliminated. 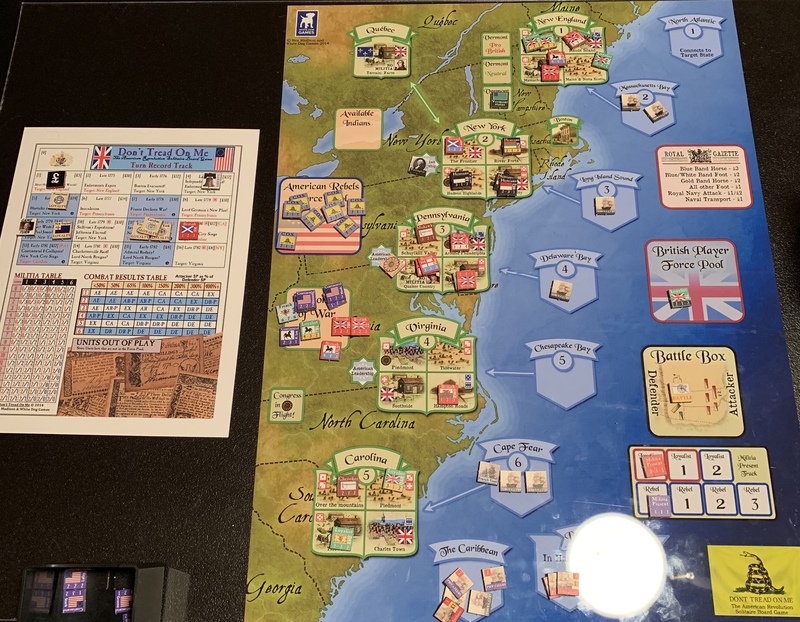 Battle of Quaker Country: No militia in Quaker Country, so the battle is a 1-6 and fought on the 50% table due to Congress’s column shift. The COS unit cannot retreat, and is eliminated. Loyalty +1, to 6. I will decline to spend any money now, as I will need that money next turn to rebuild units. The British control every state, and so Liberty stays at 4. The only loyalty change is that Pennsylvania moves down one, to 5. Cherokee Attack! : The Cherokee attack in Carolina, deploying the 2-1-1 unit to Over the Mountains. Loyalty -1, to 11. Dutch Smugglers: The infernal Dutch again place a smuggler in Delaware Bay. This turn went as well as Viceroy Kane could have hoped for. The French Army intervened, but was eliminated due to the bravery of the British Cavalry. Losing four units hurt, but being able to secure the colonies was worth it. Parliament feels that Viceroy Kane is able to handle the issues facing the colonies. Meanwhile, the Philosopher King Thomas Jefferson appears likely to secure the governorship of Virginia. While he drives down loyalty, he also brings inept command to Rebels in the state, and will provide a column shift to the British armies. Things look okay right now, but may take a turn soon. I cant wait until Michael Cohen testifies that the first two people listed here are actually the same person. That’s…hilarious, really. Though a real smh moment. I feel like I should be reviewing games, and claiming I’m you. I have to admit that I’m also kind of laughing at “coherent, playable, enjoyable” being a quote to sell a game. I know you love the game, so picking that particular set of words is just kind of funny.